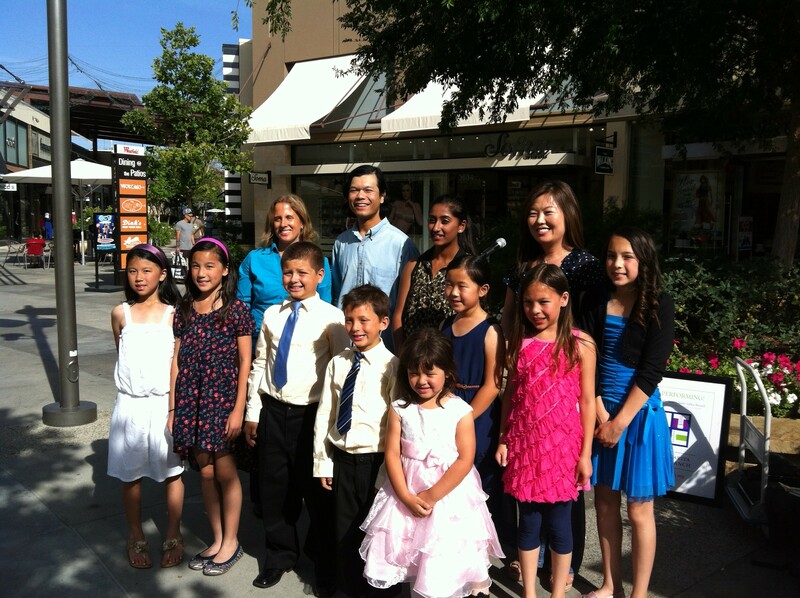 Saturday May 17, 2014 ten MTAC students performed in a piano recital at Westfield Valencia Town Center Mall in Santa Clarita at our usual spot on the outside patios near Coffee Bean and Macy’s. There was a variety of pieces ranging from classical to Martha Mier’s jazzy songs to ‘Let it Go’ from the Frozen movie. People were stopping to watch and sit down. The mall had set up 20 chairs for us. It was a beautiful hot sunny day and Manak Khamvongsa and Lisa Kim, guitar and piano teachers respectively, helped set-up the keyboard in the shaded area beside the tree. Our Music Student Service League President, Sabeena Sebastien, helped me em-cee and she performed as well. Thank you to all of the MTAC students who performed and to Manak and Lisa for attending and helping. Also, a big thank you to Madeline Miller and Adam Bendorf for enrolling their students to perform. Great concert!